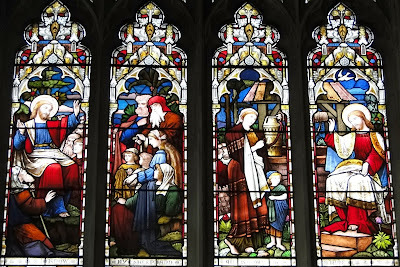 In recent weeks, I have written about the Commerford window in Saint Polycarp’s Church, in Finaghy, Belfast, and about the Catherine O’Brien windows in both Saint Mary’s Cathedral, Limerick, and Holy Trinity Church, Rathkeale, Co Limerick. 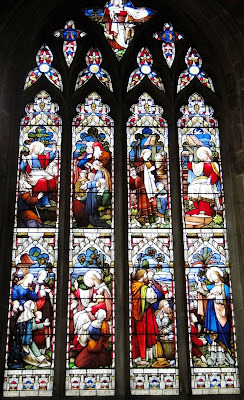 Within the past year, I have also written about the perilous future facing the windows in Saint Editha’s Church, Tamworth. 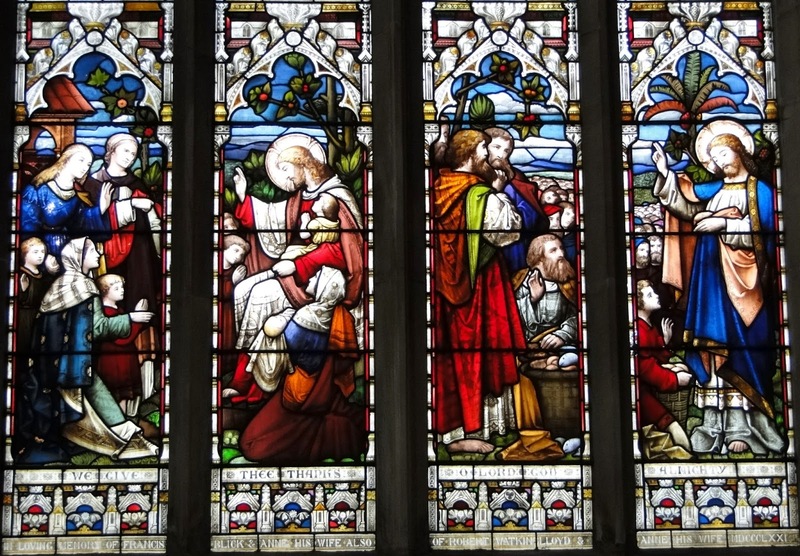 The chancel east window dates from 1870 and was designed by William Wailes (1808-1881), the proprietor of one of the largest and most prolific stained glass workshops in England. 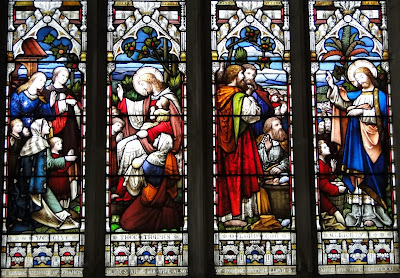 This East Window shows the Apostles, with 12 smaller angels, an inscription that reads: ‘Ye glorious company of Apostles praise thee.’ This East Window is a tribute to the Revd James Ogilvy Millar (1828-1890), who was instrumental in restoring the church while he was the Vicar of Tamworth (1865-1869). The three windows in the chancel clerestory by Ford Madox Ford and William Morris tell the story of Saint Editha. The East Window in Saint George’s Chapel dates from 1874 and was designed by Sir Edward Burne-Jones (1833-1898) for William Morris. Another window by William Morris and Burne-Jones in Saint George’s Chapel is in memory of the Revd Brooke Lambert (1834–1901), an Anglo-Catholic slum priest in the East End. These windows are among the artistic treasures of the Pre-Raphaelite Movement. 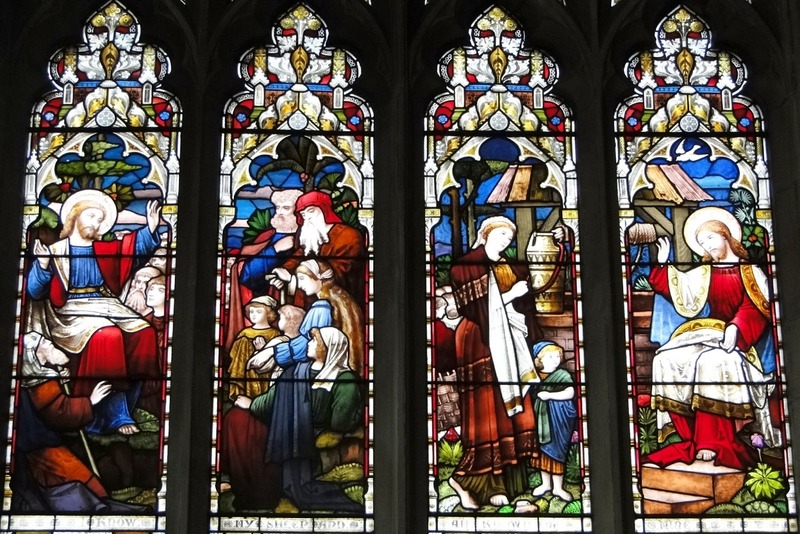 A memorial window in the North Aisle, beside the Comberford Chapel, was designed by Henry Holiday of the Arts and Crafts Movement and made by James Powell and Son at their Whitefriars Studio. This window commemorates the Revd Maurice Berkeley Peel (1873-1917), a grandson of Sir Robert Peel and for a brief period Vicar of Tamworth (1915-1917). At the time, however, I missed describing the window in the Comberford Chapel or North Transept, representing Christ the Teacher. For many decades, because of its location in the Comberford Chapel, I have been familiar with this window, which dates from 1871. This memorial window recalls two 19th century vicars of Tamworth, Canon Francis Blick (1754-1842), his son-in-law, the Revd Robert Watkin Lloyd (1783-1860), and their wives. The inscription at the bottom of the window reads: We give thee thanks O Lord God Almighty. In loving memory of Francis Blick & Anne his wife, also of Robert Watkins Lloyd & Anne his wife MDCCCLXXI (1871). Canon Francis Blick (1754-1842) was the Vicar of Tamworth for almost half a century from 1796 until his death in 1842. Some years ago in a feature in the Tamworth Herald, he was described as a ‘remarkable man’ and one of Tamworth’s least known but most worthy ‘unsung’ heroes in the 18th and 19th centuries. 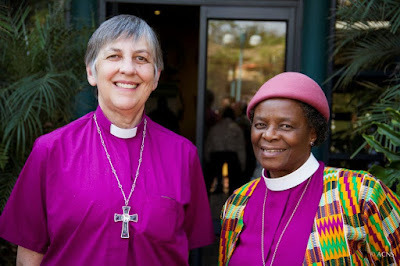 Blick was educated at Saint John’s College Oxford, (BA, MA), and was ordained deacon 1776, and priest in 1778. He was a curate first in Coughton with Sambourn in Warwickshire from 1776, and then in Sutton Coldfield from 1779. Blick’s silencing came only a few months before the Birmingham riots that year. Despite his rector’s efforts to silence him, Blick canvassed the support of some influential but partially-biased people and published what was probably a sanitised version of his sermon. 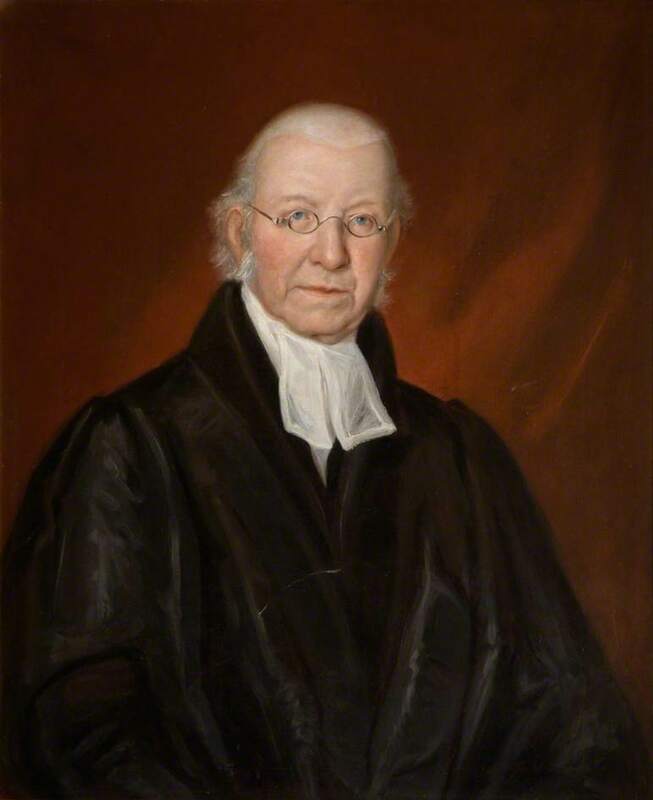 Blick may have taken his lead from the Revd Spencer Madan, Rector of Saint Philip’s, Birmingham, who in February 1790 preached a sermon equating Presbyterians with Republicans, and who was swiftly challenged by Joseph Priestley. Madan was a subscriber to Blick’s publication, which included Blick’s sermon and the correspondence between Blick and Riland. Blick then moved to Suffolk, where he served briefly as a curate in Wissett, in Waveney. But by 1795, it appears, he was teaching in Tamworth. A year later, in 1796, he was appointed the perpetual curate or Vicar of Tamworth with Glascote and Hopwas, in succession to the Revd Michael Baxter. Blick remained Vicar of Tamworth for 42 years and although he is now largely forgotten he became one of the most influential figures in the town in his time. A recent publication, Tamworth, The Parish, Town and Napoleon by Sue Wood, details Blick’s writings from 1796 to 1811. The year Blick arrived at Saint Editha’s Church, Tamworth, 1796, was the year Nelson captured the island of Elba, and the year parliament voted down proposals that Roman Catholics be admitted into the government. At the end of each year, Blick penned a memorandum of the notable events during the previous 12 months. He used blank pages in the parish register of baptisms and burials for these jottings on matters in church and town, interwoven with his comments on the war against Napoleon. The year 1798 was marked by the United Irish Rising in Ireland, and by the attempted French invasions of Ireland. Blick wrote in his ornate copperplate handwriting: ‘England, for the first time saw since she was a nation, her troops conveyed by inland navigation. Loftus (1752-1831), who was MP for Tamworth until 1812, had been an MP in the Irish Parliament for Fethard, Co Wexford (1796-1798), and then for Bannow, Co Wexford (1798-1800), before the passing of the Act of Union. He had commanded an army brigade at the Battle of Vinegar Hill in 1798. His interests in Tamworth arose from his second marriage, in 1790, to Lady Elizabeth Townshend, daughter of George Townshend, 1st Marquess Townshend, who owned Tamworth Castle and bought the Moat House, the former Comberford family home on Lichfield Street in Tamworth. He died in Kilbride, Co Wicklow, in 1831. Blick continued to teach in Tamworth, and his students included Sir Robert Peel, the future prime minister, who was a son of the first Sir Robert Peel, and he attended Blick’s school in Tamworth from 1798 to 1800. The future Prime Minister’s father, also Sir Robert Peel, also opened a school for some of the poor boys of Tamworth. Tamworth’s Free Grammar School had been founded in the reign of Queen Elizabeth I, but had become a school for boys from privileged backgrounds who had being taught by private tutors. In 1826, Blick began raising money for a new school in Tamworth, and by 1828 his efforts had raised £1,200 for the new school at Saint Editha’s Rooms. From 1828, Blick was a canon of Lichfield Cathedral as the Prebendary of Pipa Parva, He died in April 1842, at the age of 87, after he had been the Vicar of Tamworth for almost half a century. Blick was succeeded by the Revd Robert C Savage, who was Vicar of Tamworth and perpetual curate from 1842 to 1845. Blick was the father-in-law of the Revd Robert Watkins Lloyd (1783-1860) the Welsh-born son of a vicar and a member of family with many clerical members down through the generations. Lloyd, who was educated at Saint John’s College, Cambridge (BA, 1804; MA, 1807), was ordained deacon in 1806 by James Cornwallis, Bishop of Lichfield, and priest in 1807. While he was a Fellow of Saint John’s, Cambridge (1810-1812), he became the Headmaster of the Grammar School in Ashby-de-la-Zouch, Leicestershire, in 1811. After a year, he started to take boarders, and eventually filled the house with them. But he refused to instruct the free scholars, except as a matter of favour. After repeated remonstrances, the trustees appointed another headmaster. When Lloyd appealed his dismissal to the Court of Chancery in 1814, he had no success. Meanwhile, in 1812, Lloyd married Anne Blick, a daughter of Canon Francis Blick of Tamworth. Perhaps through the influence of his father-in-law, Lloyd secured his appointment as Perpetual Curate or Vicar of Wigginton, which included Comberford village, and Wilnecote in 1818. He remained in those parishes until he died at Wilnecote on 12 December 1860. Lloyd’s eldest son, Revd Francis Llewellyn Lloyd (1819-1888), was also educated at Saint John’s College., Cambridge (BA, 1840; MA, 1843; BD, 1850), and was a Fellow of Saint John’s from 1840 to 1858. He was Vicar of Aldworth, Berkshire, from 1858 to 1888, when he did much to restore the church and built the porch before he died in 1888. Pray that churches around the world might be anchored in the love of Christ so that they might be able to both comfort the broken-hearted and challenge the oppressors.